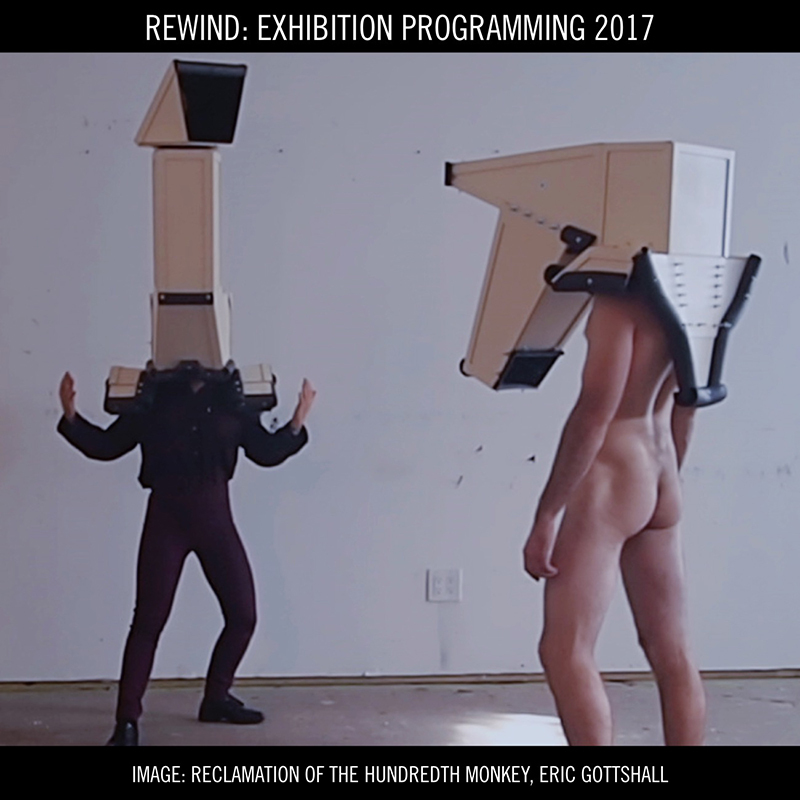 HERE is a look back at the solo exhibitions and art fair projects that comprised our 2017 programming at Art During the Occupation Gallery, Bushwick; founded and directed by Christopher Stout. 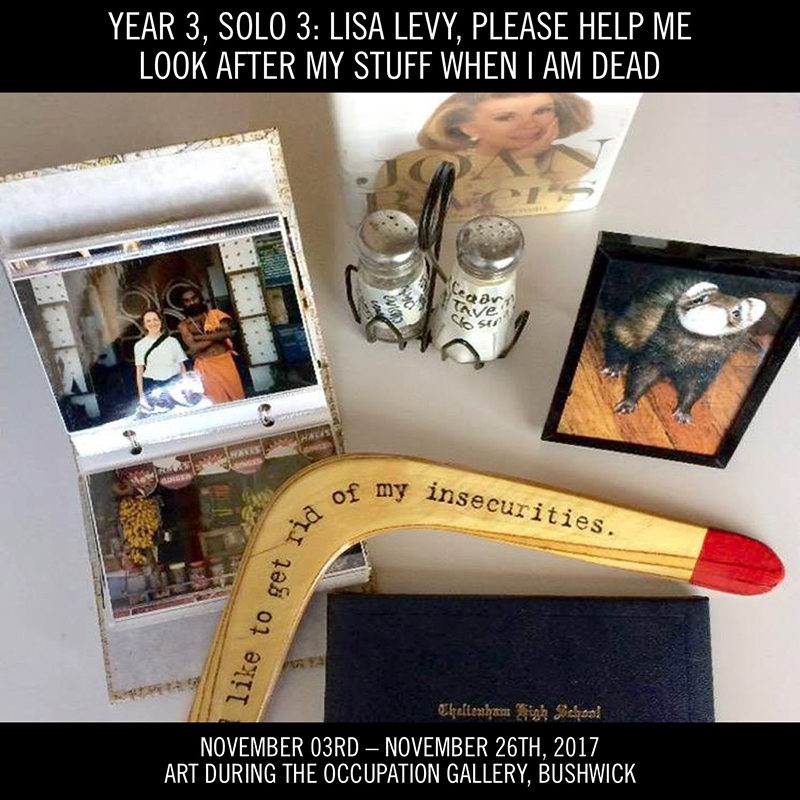 Art During the Occupation Gallery, Bushwick is pleased to announce “Please Help Look After My Stuff When I Am Dead,” a conceptual solo exhibition by artist Lisa Levy. This marks the second Art During the Occupation Gallery solo show by the artist, and also her third exhibition project with the gallery. Lisa Levy’s previous solo was titled, “The Artist Is Humbly Present” and was shown in January 2016. 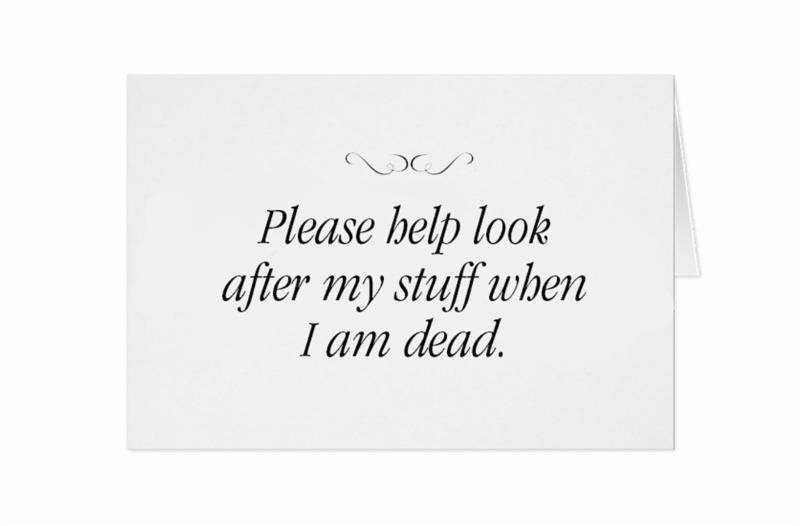 Please Help Me Look After My Stuff When I am Dead is my attempt to reassure you people that aging and getting closer to death is not as frightening and depressing as you might have been told. I’m finding some fun playing with it. I hope this exhibit helps you relax a bit. Most importantly, just try to eat right and get as much physical activity as you can. I have curated my most prized possessions and numbered them. I am inviting you to choose one or more so I can leave it to you and feel better about my impending death. (As far as I know, I am in good health. I am hoping to make it to my 80’s.) I’m asking you to fill out a card because I will need your info. I also want to know how you relate to the object you selected so that I can make sure it gets to the person that wants it the most. I appreciate you “adopting” my things. It will help me feel secure in my aging! 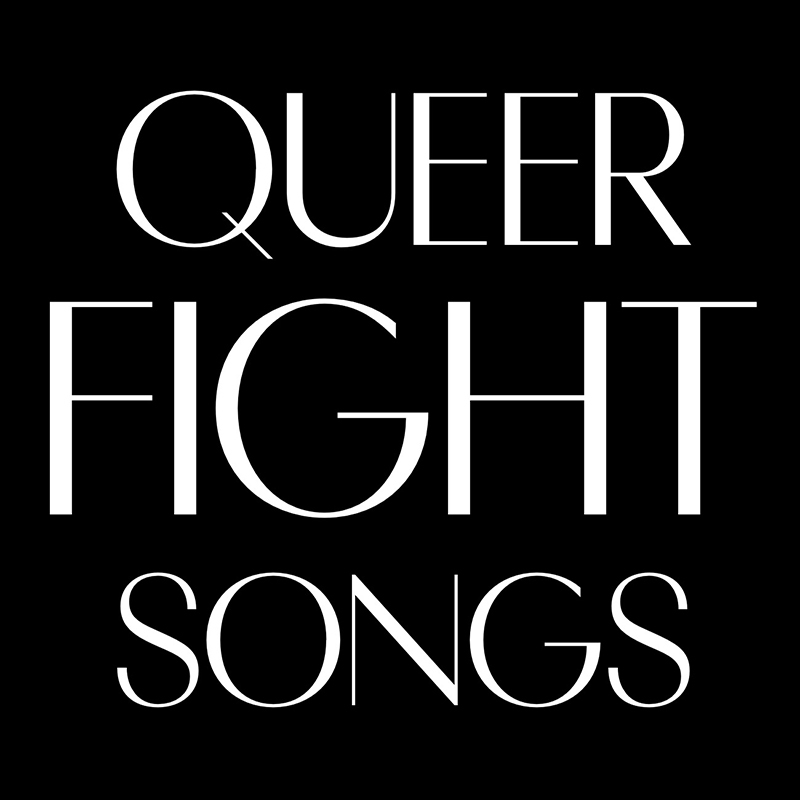 Art During the Occupation Gallery, Bushwick is pleased to invite you to our second presentation of YEAR 3, a group exhibition titled QUEER FIGHT SONGS. You are cordially invited to this notable queer group exhibition with work by Andrew Cornell Robinson, Anthony Viti​, Cupid Ojala, Gran Fury, Hunter Reynolds, J. Morrison, John Hanning, Mark Morrisroe, Peter Clough, Phoenix Lindsey-Hall, and Vincent Tiley. 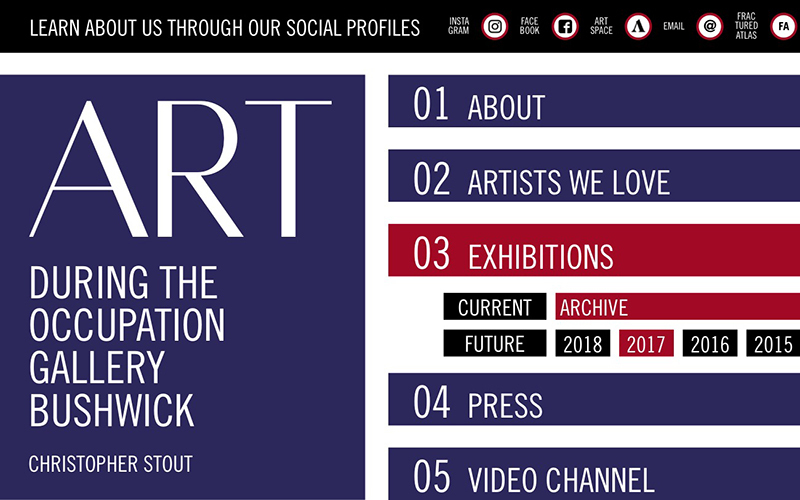 This exhibition is a philosophical extension of our 2017 Armory week presentation at SPRING/BREAK Art Show, and has been joint curated by gallery director Christopher Stout​ with Rick Herron​. 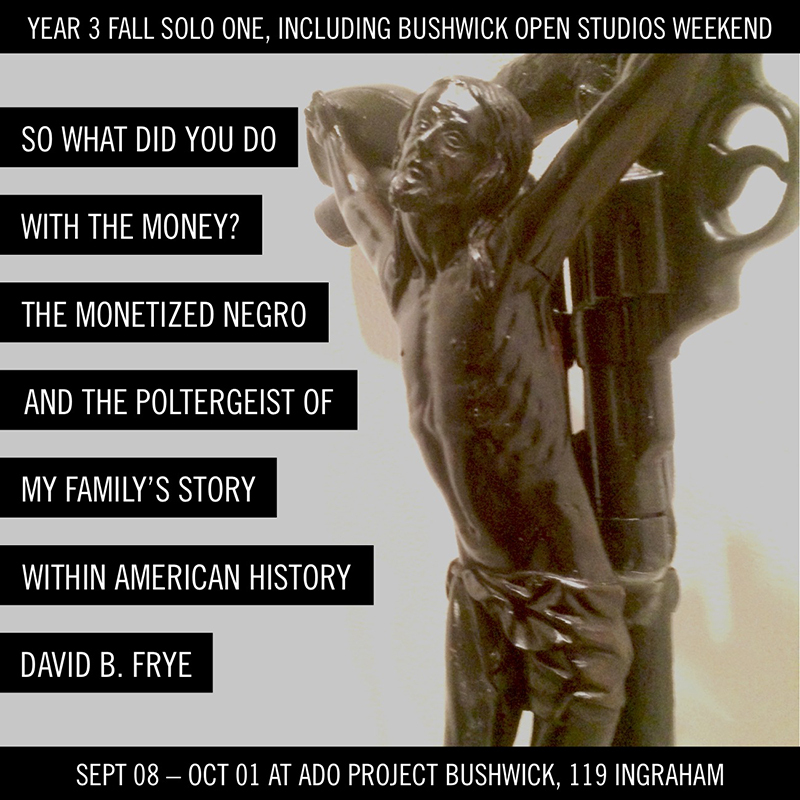 Art During the Occupation Gallery, Bushwick is pleased to invite you to our September gallery solo by artist David B. Frye, a series of paintings and wall-mounted sculptures that explore the comparative experiences between his family post-1865 with the family (same surname) that owned his family. An essay by the artist entitled, “A Bizarre Rite” accompanies this solo of work, which has been curated by artist Linda Griggs. Art During the Occupation Gallery, Bushwick is a not for profit contemporary art space, showing subversive and difficult work. We delight in serving as a platform for discourse on work that is challenging to authority paradigms, feminist, queer, anti-establishment, hyper-aggressive, mystic, and/or joyously sexual. 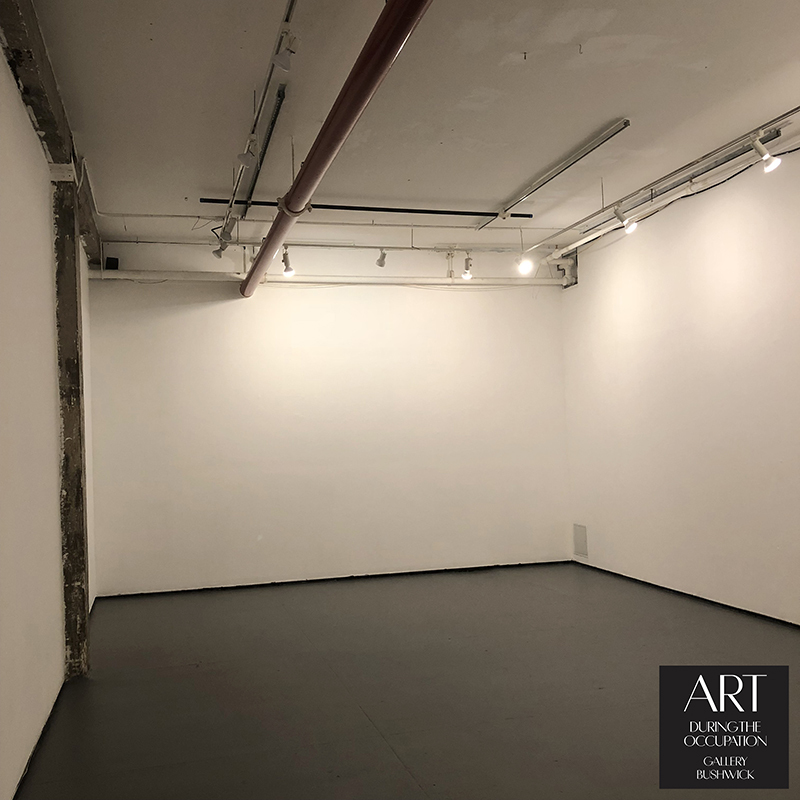 Art During The Occupation Gallery, Bushwick is pleased to invite you to our July gallery solo by artist J. Morrison; a performance titled, ESCAPE FROM NEW YORK with special limited showings. This work is highly unconventional work for a gallery exhibition in that it is done in groups of 3 people. It is free to experience the performance, however you must reserve a time in advance. Learn more information and get your tickets by clicking the link below. 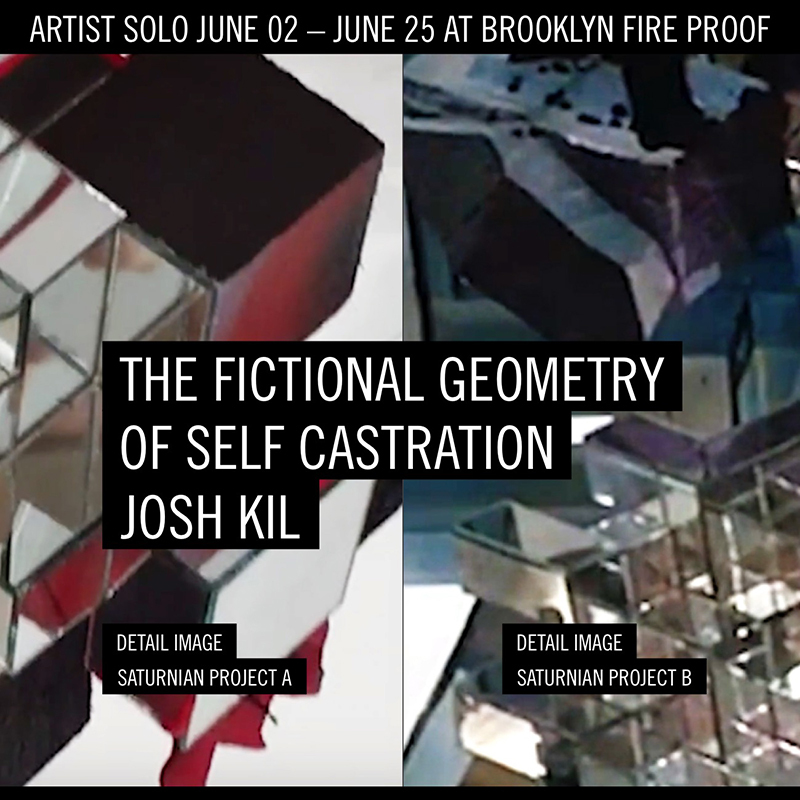 Art During the Occupation Gallery, Bushwick is pleased to announce “The Fictional Geometry of Self-Castration,” a sculpture and performance solo exhibition by artist Josh Kil. This marks the second Art During the Occupation Gallery solo show by the artist, and also his sixth exhibition project with the gallery. 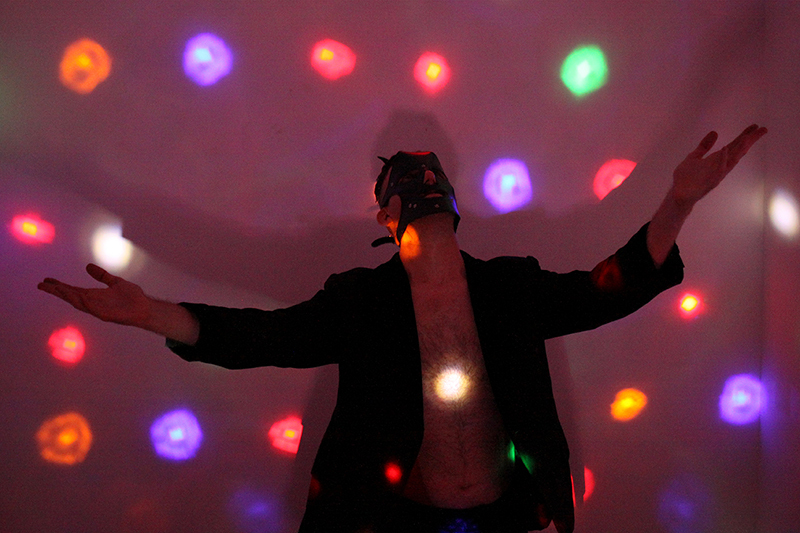 Josh Kil’s previous solo was titled, “Neither Coincidence Nor Destiny” and was shown in January 2016. “The Fictional Geometry of Self-Castration,” presents work dealing with paranoid views of perception to address the difficulties of analyzing reality. Gallery Hours: Friday and Saturday Noon-6:00pm, Sunday 1-5pm, and also by private appointment. 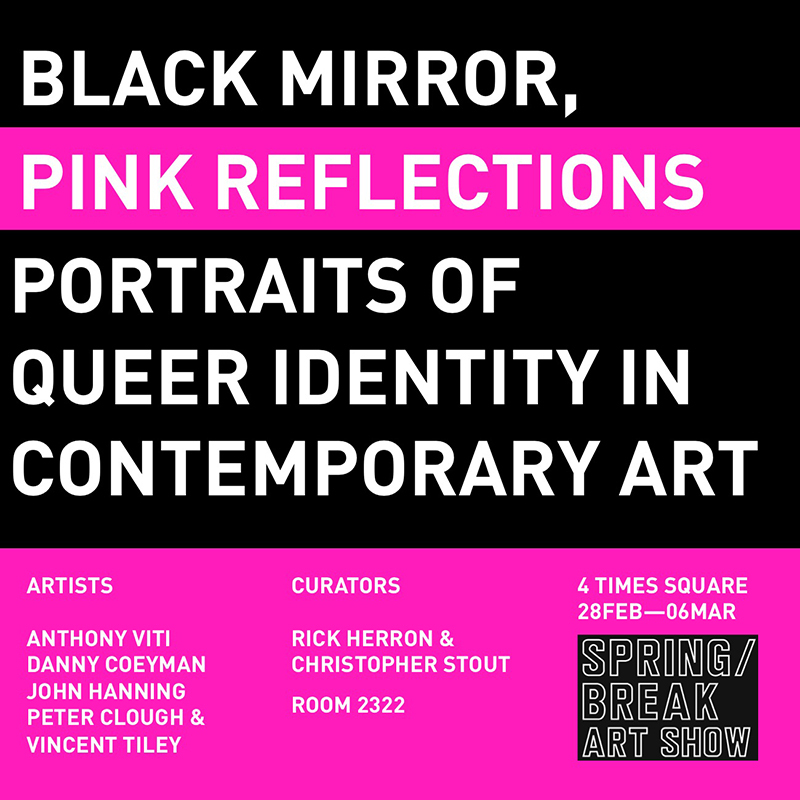 Art During the Occupation Gallery, Bushwick gallery director Christopher Stout is thrilled to present, "BLACK MIRROR, PINK REFLECTIONS, PORTRAITS OF QUEER SELF-PORTRAITURE IN CONTEMPORARY ART," curated with Rick Herron during NYC Armory weekend with SPRING/BREAK Art Show. This was our third year working with the organization. Our presentation consists of the work of Anthony Viti, Peter Clough, John Hanning, Vincent Tiley, and Danny Coeyman, and is a pairing of work from the AIDS ART generation with new voices in queer self-portraiture. “My art attempts to satirize pinnacle moments in human evolution. Commonly know as the 100th monkey phenomenon, this phrase articulates the very moment when human involvement in a given social trend explodes to ubiquitous proportions. I thus create faux medical devices ( F. A. C. E. Units: Facilitating Analogue Cerebral Exploration), which attempt to mitigate, or even eliminate said social movements from happening. These devices demonstrate the primal pessimism and fear; which remains persistent through our species when new, shifting sociopolitical trends, for better or worse, emerge.